Has there ever been a government like Australia’s? One more prone to gaffes and stumbles, mind melts and the utterance of utter inanities and idiocies; one more arrogant, asinine and absurd? Not now. Not after listening to Treasurer Joe Hockey stumble and bumble last week over “poor people” and then reading Prime Minister Tony Abbott’s comments about Scottish independence. That is the sort of comment that could only come from someone insulated in the affluent, cosy North Shore of Sydney, who has no idea what it is like to be short of money ‒ to be out in the Western suburbs, or out in the bush ‒ where there are no trains, few buses and you need to drive for miles to get anywhere. These are the people who are slammed by increases in fuel costs — not the rich. Then, after a day and a bit of brazening it out and defending his comments as harsh but fair, the tide of public sentiment got too much for even slow old Joe to ignore and so he made an apology … of sorts. What sort of apology was it? Was it on the ABC, so as to go out to all Australians? Was it gracious and humble, with the appropriate measure of contrition and remorse? Don’t be daft! No, no, no, no and no. It was on the lunar rightwing Sydney 2GB radio station, famous for Alan Jones’ maniacal rants, being gently coddled by his personal friend Ben Fordham, another rightwing shockjock. And it wasn’t so much an apology as a how terrible, I’ve been badly misinterpreted by my enemies, now everyone hates me. It’s so unfair. I’m a nice guy, really! “I am really genuinely sorry that there is any suggestion, any suggestion at all that I or the government does not care for the most disadvantaged in the community. “I’m sorry about the interpretation, I am sorry about the words. “All of my life I have fought for and tried to help the most disadvantaged people in the community. "For there to be some suggestion that I have evil in my heart when it comes to the most disadvantaged people in the community is upsetting. "But it’s more upsetting for those people in the community. So I want to make it perfectly clear to the community that if there’s any suggestion that I don’t care about you or that I have evil intent toward you, I want to say that couldn’t be further from the truth and I’m sorry for the hurt." Yes, Joe is really a fighter for the disadvantaged — as you can see by his Budget, which brutally attacks the poorest and least privileged people in our society. And this is no “suggestion”, it is an undeniable fact. As if that wasn’t bad enough, then came news over the weekend of Tony Abbott’s latest foray into the field of foreign diplomacy (god help us). Fresh from, with little or no proof, accusing Russia of bringing down MH17 and causing them to cancel farm produce contracts with Australian exporters, Abbott was in London last week doing who knows what — certainly not seeing British PM David Cameron, who was on holiday. There, our gormless PM decided to weigh in on Scotland's forthcoming 18 September independence referendum. BREAKING: George W. Abbott declares Scotland part of the axis of evil. "As a friend of Britain, as an observer from afar, it's hard to see how the world would be helped by an independent Scotland. "I think that the people who would like to see the break-up of the United Kingdom are not the friends of justice, the friends of freedom, and the countries that would cheer at the prospect ... are not the countries whose company one would like to keep." That’s right, Scots campaigning for an independent Scotland are enemies of justice and freedom — he really said that. But it’s not like it is only Abbott and Hockey who are floundering away, leagues out of their depth. No, you only need to listen to Employment Minister Eric Abetz make a link between abortion and breast cancer on national TV, then hear him the next day attempt to categorically deny he'd said what everyone in the country heard him say; or Attorney General George Brandis expound upon our unalienable right of to be bigots, or blither and blather about “metadata”, to become painfully aware of the profound levels of incompetence at the top of the Abbott machine. I used to think they were mad — but then I realised I was wrong. Madness might suggest there's a spark of genius lying somewhere within them — but this mob certainly don't have any of that. No, now I just think they are stupid. Oh, and petty, and venal, and nasty, and malicious, to be sure — but mostly just demonstrably dumb. 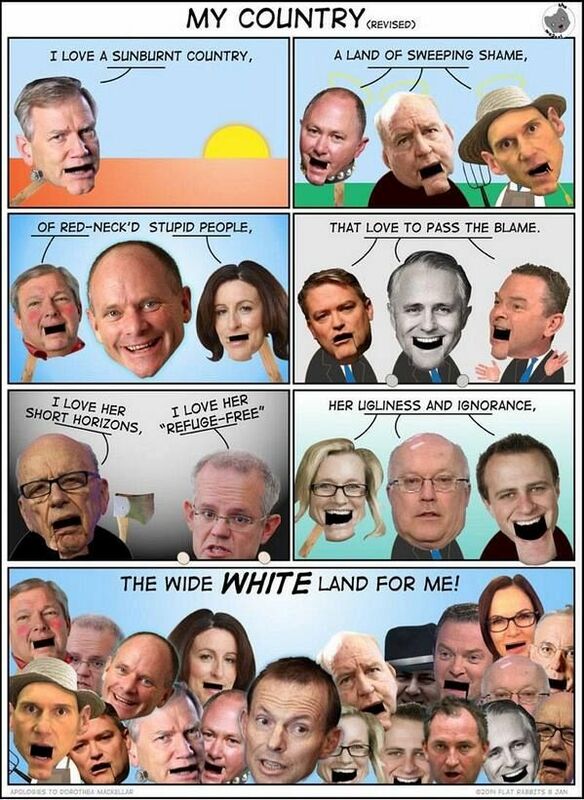 How did it come to pass that Australia ended up with such a ragtag bunch of clowns, fools and cartoonish villains holding the levers of power in Australia and making critical decisions about our collective futures? How did we end up with people in power who are more ‘gaffe-a-minute’ than government? Of course, we could always blame the media, but even they couldn’t fully obscure the now blindingly obvious nature of this Federal Government. And there were plenty who were warning about them before they became the Government ‒ some rather loudly, like IA ‒ but the public voted them in just the same. Hopefully, the pain will not last too long — although heaven help us if they are voted in again. For now, there is nothing else to do but sit back uncomfortably and wait for the next mortifying public utterance; the next embarrassing, nation-shaming gaffe. “@courteneyh: 1000 times this. RT @davecallantwit: AUTHOR pic.twitter.com/X9S3QazrJf” + one.